I first met James Parker at the Ontario School of Piping at St. Andrews College, Aurora, ON about eight years ago. James was from Louisiana, and had the room next to mine in the residence. Between his self-described ‘slow southern drawl with a bit of East Texas twang’, and his Scottish instructor’s heavy Glasgow accent, communication in his class was a little problematic. We had the same period off so, on the second day, James knocked on my door and asked if I would explain a few things. The next day, he brought along the rest of his band’s pipe section, and we set up a little auxiliary class that met daily for the rest of the course. The following year, I was invited to officially join the teaching staff, and have been working with beginner and intermediate level students at the OSP ever since. James invited me to Shreveport to conduct a three-day workshop for his band, which was one of the highlights of my piping career. I have considered him and many of his band members to be very good friends ever since. 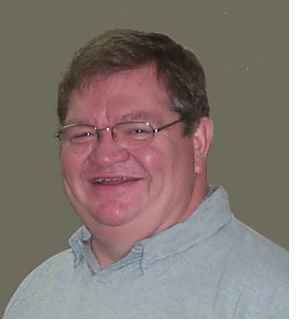 James went to High School at Woodlawn, in Shreveport and also took night courses at Bossier Parish Community College. “My piping journey started in high school,” James explains. “My first instructor was my ROTC instructor, Sgt. Floyd J Courtade, RET. U.S. Army. He did not play himself, but he wanted to form a pipe band. He banged on the table a lot and would say ‘that does not sound right’, or ‘play the record for us again’! He was a very important person in my life and is a fine gentleman and honourable person. You could not find a greater role model for me and for most of the students he taught. “The year was 1971. The Viet Nam War was winding down but as young boys we all thought we would be going. I, like many of my friends, thought if we’ve got to go, officer training and military knowledge would be good to have so many of us joined the Corps. The first day of high school, I went to my first ROTC class. The Sergeant seemed like a huge bear of a man to me at the time. We were all scared a little not knowing what to expect - too many boot camp movies, I suppose. His voice boomed, ‘Who in here plays in the band or plays a musical instrument?’ Two hands went up, mine and that of my good friend Robert Davis, now our lead tip in the Red River Pipes and Drums. He said, ‘You are in the wrong class. Report back here at sixth period. I will get your schedules changed.’ And he did! Our school’s band Director at the time, Mr. Charles Caskey was helping Sarge to get a pipe band going. He didn’t play either. The Logan’s Tutor Book was all we had at the start. “Some of us kids started with the band from the beginning in 1969 when Sarge went over to Scotland and brought back sets of Sinclair pipes. I still have mine. They still sound great and look good at Halloween, with orange-coloured mounts on the African Blackwood drones. It was mostly kids who did not know how to play teaching other kids, and that was not a good thing as we found out that first summer when we went to a Highland games in Houston to play all 15 of our tunes. We played with no gracenotes except the Hi G gracenote at times and we just fingered the melody any way we wanted to. Tuning? What was that? We just blew up our pipes and played. It was not a good experience. Most of the other bands that were there would have nothing to do with us, or each other, for that matter. Members from one band did come to help us, however. They were Shriners from Houston. They spoke to Sarge and, the next thing we knew, we had summer school for two weeks set up in Dallas, Texas in 1972! We got a new book that we called the ‘Little Green Book’ before we knew to call it the ‘College of Piping Tutor’. “My first piping teacher that could actually play was Seumas MacNeill, from Glasgow, Scotland, the co-principal of the College of piping, co-author of the little green book, and head instructor at the summer school. He was soft-spoken and proper, gentle but firm, and you could not get away with anything! The first day of the summer school we had to audition for our class placement. I walked in and he introduced himself and asked me how many tunes I could play on the pipes. I said all of them! His eyebrows shot up and he said ‘Really. As many as that!’ I then said well, all the tunes in your book and some others too, perhaps about 20 altogether. He said, ‘Play your best one.’ I got the first 3 bars of Scotland the Brave out before he stopped me and thanked me very much. I went out and then in went the next piper from our band. There were seven of us in all. James continued playing through high school and then started a band with other grads from Woodlawn a few years after. With people moving, and working lives getting in the way at times, however, the musicians slowly disbanded. “I continued to play for funerals, and at my school’s memorial for former students who were lost in Viet Nam. Sadly, more names have been added to the Memorial in recent years. I still play for it as I have done almost every year since 1971. I missed only two years. One was when I was overseas working and I had a friend cover for me. The other was when a new principal at the school decided the Memorial was not time well spent and cancelled it. He soon found he had a firestorm on his hands, so the Memorial has been reinstated. “I only knew a few marches and slow airs and played only a few times a year, usually when I was sought out. Then one day my daughter came home from school and said her friend’s cousin, Shon wanted to know if I would teach him to play. I was working a lot then and said I don't know how much I could teach him, but I would try to show him what I could. I gave him a few lessons and went off to work again for a while. “Then one day Shon, who later became my son-in-law, called me and said Richard Wells, who was an old friend I had taught in High School and who was blind from birth, was going to give piping lessons at a local college. He taught the class for six weeks but moved away shortly after a few of the students started a band. Shon asked if I would come by and see if I could help them out. I was more advanced than the others, so I started teaching what I knew, and I was able to give them good fundamentals. While working with them, I found out about many new things, such as synthetic reeds and synthetic pipe bags – imagine, no more mixing honey with lanolin to season the old hide bags! “I also found out about Jim McGillivray’s Ontario School of Piping summer program at Aurora, Ontario and I enrolled. I wanted to make sure that what I was showing people was correct, and thankfully it was, but it was just not enough! I went to the OPS summer school almost every year since that time and it was a highlight in my life to hear such great players and to study with so many of piping’s great teachers! I had one very famous pipe teacher help me a lot, and he even composed a tune for me! My band plays it in our competition medley, and it has had many good comments from judges. Thanks Scott! You know it was you! 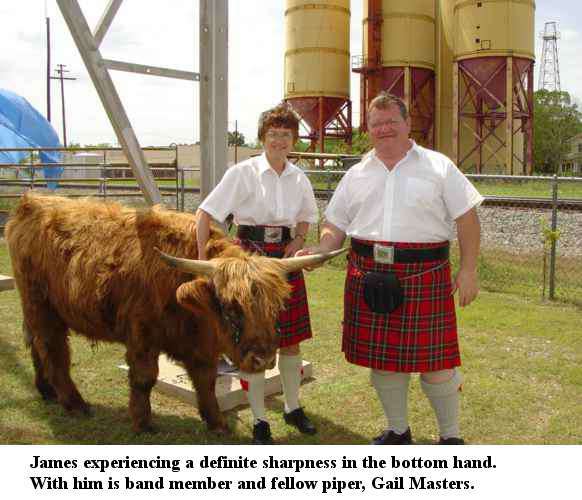 As James progressed in his own skills, he had a lot of success in solo competitions in the South. 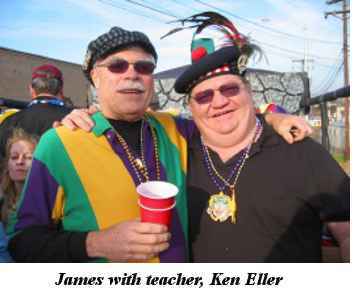 He won the Piper of the Day awards in Jackson, Louisiana and Jackson, Mississippi. “Too bad there is not a Jackson, Scotland,” James quips. James placed in the prize list at every Highland games at which he competed. He is now playing at the Grade 2 level but hopes to move up to Grade 1 soon. “My most memorable achievement was the time our band placed second at one particular Games. Don't get me wrong - we have won some firsts but this one stuck out in my mind because of my band mates and what we had done. I was very happy with the quality of our sound that day, and with all of our players and the work I knew they had put in. We played a good performance for the crowd, and had good remarks from the judges as well. We are still learning and moving forward, and not doing too bad for a little band from the black hole of piping! “My most prestigious achievement is a tune I composed, called “Debbie's Needle Point”. James Mac Hattie put some harmony to it, and it was played in the Grade 1 Toronto Police Pipe Band medley a while back. How great is that! Another great honour was to have you write a tune for me, Scott. I have it framed with a picture of the two of us on my office wall. I have also had the honour of playing to a number of great Military leaders of the United States and a few famous actors as well as at the funerals of many local people of interest. 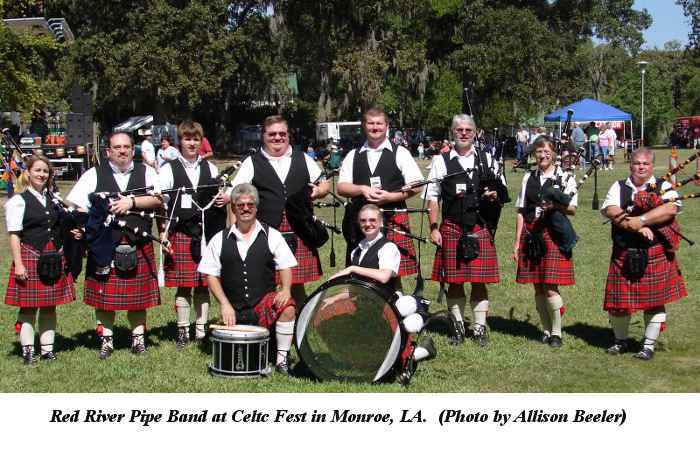 I played with the Shreveport Symphony twice as a guest soloist to promote bagpiping in the community. On one occasion, I played “The Orkney Wedding” and on the other I played “Brave Heart”. I had to carve up an old Pakistani pipe chanter to make it tune to concert pitch 440 since the symphony wouldn’t tune to me. “I belong to the Mid-West Piping Association. From time to time I have gone to other bands that have asked for my help and I am always glad to do so. I think we all want our music to get better and to have the bagpipe recognized as the beautiful instrument it is. The more we know and the more we practice, the more the public at large will hear the beauty in our music that we do. “Small classes are the way we go here. This year, we had five piping instructors, Ken Eller, Jim McGillivray, Rob Crabtree, Jack Lee and Angus MacColl, and one drumming instructor, Steve Cameron, with a total of 51 students. The school is not a moneymaker by any stretch of the imagination. We have never even broken even. Our band subsidizes the school with money made throughout the year at paying gigs. Everyone in the band contributes to make it happen. We want the music in our area to be the best it can be! “I think the biggest recommendation I have for bands is to recruit the young but don't leave the old behind. This is a wonderful life with music in it for everybody. Everyone can be of service to the cause. Some of my best friends and family are in the band. Our band has a wide spread in ages, but we are one big family at heart. That makes it all the better. “For people starting out, my advice to you is never give up. Any instrument takes dedication and work to reap the rewards. Playing the pipes is like taking uneven stairs. Your head is always ahead of where your feet are, and so it is with playing. Your knowledge grows quicker than your skill and it can be frustrating at times. Just slog through it. It could take minutes, or months to get something just right. We have all encountered the same problems. Some just get through them quicker than others. The key is to never give up! You may put the pipes down for a while but, the better you get, the stronger the call of the blood becomes, and believe me, pipe music does get in your blood! Seek out the best players and teachers. You can learn from many different people. Take from each what works for you. There are also many good books to learn from now and many excellent recordings. However, in my mind and from my own experience, having a good teacher with you is something that cannot be beat!